2. What is a package? All modern linux distributions organize software in packages which contain applications binaries, files, metadata and information about the package dependencies, possible conflicts with other packages etc. The core Rhel package manager is called rpm itself, and it is the tool used also by dnf, the higher level package manager, which is capable to manage dependencies. A relatively recent technology , flatpak, let us install also sandboxed applications together with their runtimes. Software The utilities used in this tutorial are installed by default, there is no need for additional software. Other Permission to run command with root privileges. In Red Hat Enterprise Linux 8, like in all modern linux distributions, software is organized in repositories, in the form of packages. But what exactly is a package? A package is basically a compressed archive which contains the files associated with a specific software, like compiled binaries and libraries, plus metadata and instructions about where and how those files should be installed on the system, the external dependencies the software needs to run correctly and more. Red Hat Enterprise Linux uses the rpm package format which was invented by Red Hat itself: in this tutorial we will see how to install and manage rpm packages on Red Hat Enterprise Linux 8. To ease the management of rpm packages, the rpm package manager was created. Although very powerful, it is focused on single packages, so it is not able to resolve dependencies. To manage the relationships between packages, and avoid the infamous dependency hell, first yum package manager (Yellow Updater Modified) and then its evolution, dnf (Dandified YUM), were adopted. Dnf was firstly introduced in Fedora 18, and does replace yum in the last version of Red Hat Enterprise Linux. One of the most basic operations we can perform with rpm is the installation of a package. As said before, this will work only if the package has no external dependencies, since rpm is not able to manage it. There are basically three ways we can install a package with rpm: they correspond respectively to the -i, -U and -F options. Notice that here for same "package" we mean same exact version. This method of installation is the recommended one to use when performing the installation of a new kernel: in such situations, the new kernel will coexist with the older one(s), so in case something doesn't work as expected, it will be possible to use them as a fallback. Things go differently when we use the -U option, which is the short for --upgrade. In this case if a package doesn't already exist in the system, it is installed; if a previous version of the package exists, the package is upgraded. This means that after the newer version of the package is installed, the older ones are removed. As we said above, upgrading a fundamental piece of software like the kernel in place is highly discouraged: it's better to be absolutely sure that the new kernel works as expected before removing older versions. The -F (or --freshen) option does something different. When it is used, only already existing packages are updated. If a previous version of package we are trying to install doesn't already exist in our system, it is not installed. If running dnf from a script which is meant to run unattended, the -y option (short form of --assumeyes) can be used: that way all the answers will receive a 'yes' response automatically, and user interaction will be required. When installing a package with this method a different procedure is used. The gnome-software applications is a frontend for packagekit which is itself a high-level frontend which works as an abstraction over the native package manager of a distribution: its main goal is to uniform installations on different distributions. It's also important to notice that packages installed this way will not appear in the dnf history, since packagekit doesn't use the latter under the hood. 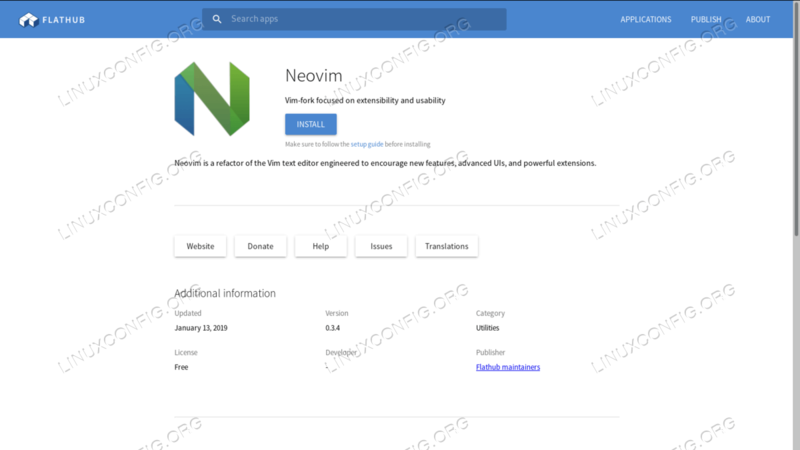 On Rhel8, another possible way to install software, both from the gnome-software application, or from command line, is to use flatpacks. Flatpacks provide sandboxed environments inside which a software is provided together with all its dependencies: this makes possible to run a specific version of a program on all the distributions which support this technology, independently of the native libraries. The main repository of flatpacks is flathub. Installing a flatpack from this site with gnome-software is really easy. All we have to do is to search for the application we want to install and click on the install button. Gnome software should be automatically launched: if not, just open the downloaded file with it. After we click on the install button, and provide our administrative password, if required, the package will be installed. 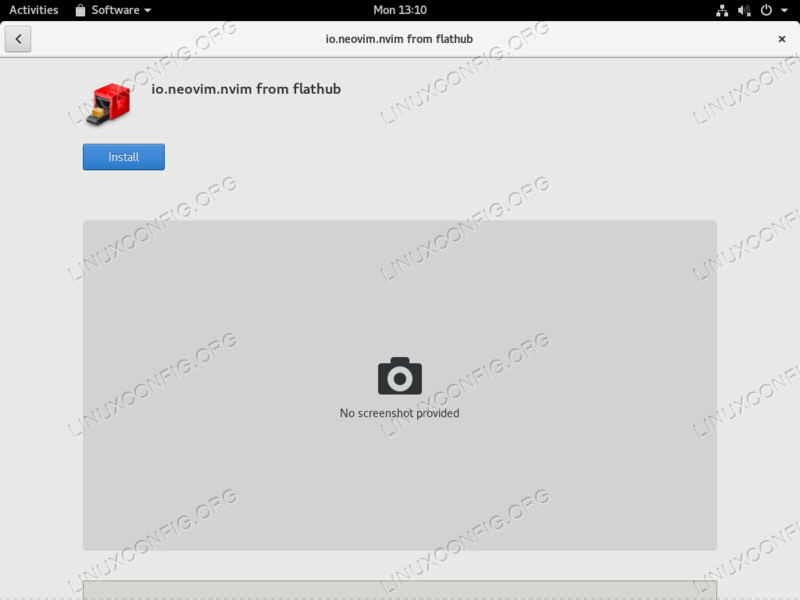 Once we install a flatpak this way, the flathub repository is automatically added as a flatpak source, therefore it becomes possible to search for other applications contained in it, directly from the gnome-software center interface. In this tutorial we saw various ways to install software on Red Hat Enterprise Linux 8. Software is organized in packages, which at a low level are managed by the rpm package manager which cannot resolve dependencies automatically. To provide this feature and more, the dnf program, which works on top of rpm, is used. Finally we learned to install sandboxed software using a relatively recent technology, flatpak.